If you're running version 10.x, you should upgrade to DMPE-2 (12.5). The improved speed and accuracy of this version is very significant and you will be delighted with the change! Upgrades are available from us. The MSRP for upgrades is $599 as opposed to $1599 for a new purchase. We always discount below the MSRP, so please contact us for a quote. Currently Nuance allows upgrades (at the upgrade price) to advance two versions (e.g. v.10 to v.12). DMPE-2 is now 3 years old, so we are long overdue for a major upgrade. If DMPE-3 is released, and you're still running v.10.x, you will need to pay the full new purchase price. If you're running Dragon Medical versions 12.0 or 12.50, you should consider patching up to at least 12.52. There are significant bugs in 12.0 & 12.50 that adversely affect some EHRs & some functions. HOWEVER... You should seek our assistance to do this. User profiles created on 12.0 or 12.50 will not run on 12.52 or higher. 12.52 profiles will run on 12.53 without change. There is no charge for downloading patches 12.52 - 12.53. We regularly get calls from clients where a user has patched their version up to 2.3.1, and then receives error messages about an outdated user profile. For this reason, we now recommend that IT departments turn off end-user notifications regarding new patches. For assistance in doing this, please contact us. If a user is having no problems with their 12.x version, and they will never use another machine (that may have a newer or older version installed), you can leave well-enough alone. Problems arise when a user has to switch to another machine and the software versions / profile versions are incompatibile. Unfortunately, there is no one download that will take you automatically through several of these patches. You need to download/install each of them in turn on each machine. You can save significant time by saving each download to a shared drive, or a RAM drive. PowerMic-III microphones (new replacement for PowerMic-II). This is not essential. 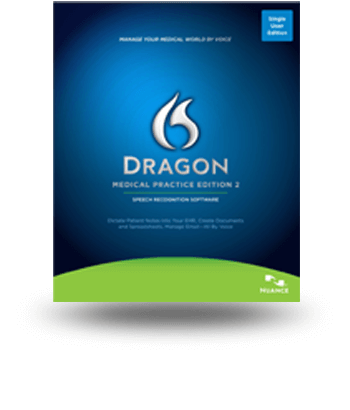 If you have questions, or would like to request Dragon Medical Training, please email support@tcemr.com.